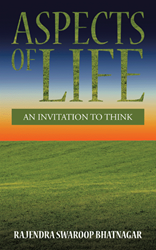 In “Aspects of Life: An Invitation to Think” (published by Partridge India), author Rajendra Swaroop Bhatnagar explores dilemmas he has faced and offers insight for his readers on how to perceive life and dichotomies. Since the issues in the book are closely related to daily life experiences and explore different dilemmas, as well as possible questions that arise as people go through their lives, “the book directly relates to today’s society by talking about the very foundations of human existence, life and relationships,” he adds. That we raise questions about reason, we raise questions about actions, we raise questions about explanation and justification, that we raise questions of this sort distinguishes us from all the rest of the living beings. Perhaps, it can also be said, that we raise questions of this sort because we have reason. This voice of reason blares in the interrogative “why.” The most intriguing aspect is why we human beings slip away from this essential characteristic which defines us. Rajendra Swaroop Bhatnagar earned a doctorate in philosophy from Allahabad University and taught philosophy at Rajasthan University, Jaipur, until his retirement in 1992. He enjoys reading and writing and is also author of several philosophy textbooks. Partridge India, a Penguin Random House company, is a leading provider of book publishing, marketing and bookselling services for authors in India, all priced appropriately for the Indian market. Committed to providing the highest level of customer service, Partridge India assigns each author personal publishing and marketing consultants who provide guidance throughout the process. Partridge India shares its headquarters with Penguin Books India in New Delhi. For more information or to publish a book, visit http://www.partridgepublishing.com/india or call 000.800.10062.62. For the latest, follow @PartridgeIndia on Twitter.